More than 900 GEO users have already downloaded version 1.3 for managers and staff, so if you know someone who’s looking for an upgrade, do them a favor and tell them version 1.3 has arrived. We've included a functionality which a number of clients have been waiting for; the ability to assign maintenance requests to specific employees only, and the option of choosing to view and work with requests for one or more specific employee(s). And because we had some extra time on our hands, we also added “employee photos” to the GEO screen. This means you can now see the employee that you are assigning the work order to. Perhaps this will help you remember who’s best suited for a certain task? Or it’ll remind you that you’re better off doing it yourself... Either way, figured we’d throw that in there just for fun. GEO version 1.3 is available to download from the App Store. NEW FEATURE: What’s your (occupant) type? Our development team has been hard at work building one of this year’s most asked for functionalities. As per usual - they delivered. That’s why we’re happy to announce that “Occupant Types” is now live on your management portal. 2. Similarly, when posting library documents, you can choose exactly which occupant types have permission to view those documents (i.e. share sensitive financial info only with owners). In addition to the "obvious" occupants (owner, renter, leaseholder, etc. ), you'll be able to choose from a generous buffet of different occupant types. Naturally, you can choose which ones are appropriate to use for your property. Here comes the full list: Owner, Leaseholder, Shareholder, Homeowner, Co-owner, Sponsor-owner, Renter, Subtenant, Sub-lessee, Sublettor, Corporate Renter, Tenant, Resident, Co-Resident, Family Member-Spouse, Family Member-Child, Family Member-Other, Live-in Help, Roommate, Other Occupant, Guarantor, Agent/Broker, Client, Lease Assignor, Lease Assignee or Personal Assistant. There's more information available for manager-level and board-level users under the "What's New?" tab on your management portal. If you have any questions about this new functionality, please contact our support team at support@buildinglink.com. In order to better organize the growing functionality of the BuildingLink site, we’ve added a brand new “Resident Site” button to your BuildingLink page which allows Managers to view and manage all aspects of BuildingLink which deal with the Resident Site from one convenient location. Under the new “Resident Site” button, you will see that we migrated a few existing pieces of functionality away from where you’re accustomed to finding them, to this new section. We also enhanced older features like Services, Offers, and the Directory of Local Vendors to make them easier to find and work with. We have added a new button, in the left column section, called “Resident Site”. In this section, we have pulled in “stuff” that used to be under other buttons, but that better belong to the new “Resident Site” button. 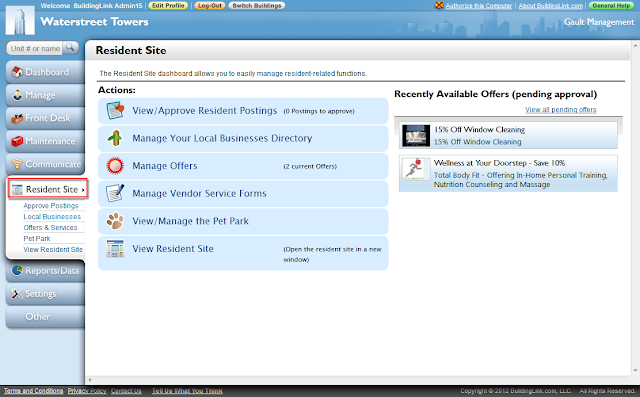 Offers and Services (from outside vendors) and Local Businesses Directory - These are now found on the Resident Site dashboard, and an easy to use multi-tab strip allows you to more easily view and manage the status of vendor offers. 1. You can now view and approve resident postings from this location. Don’t worry, nothing has changed in regard to the Bulletin Board, but we thought it made sense to include that here along with other resident-focused functionality! 2. The Directory of Local Vendors underwent a slight renaming and is now the Local Businesses Directory. Adding a vendor is now a quick and easy process since you’ll be able to search and add from our master list of vendors (just like you can in the Vendors Directory in the Maintenance module). If the businesses you want to add don’t appear in our master list, you can still always create your own entry, but this will hopefully save you some time. 3. The Offers module is now very much enhanced – you can now choose to require that all new offers are approved by management before they appear on the site for your residents. You’ll be able to clearly view which offers were created by vendors themselves and which have been created by your building; a new view of rejected offers and pending offers is also included, as is a link to view what the residents will see on their Offers page. 4. The functionality hasn’t changed for Service forms. Like Offers, though, you now have the ability to select whether new services in your area automatically appear or if you would prefer to approve them first. 5. Pet Park – for the first time, you can view the pet photos and info that your residents are posting in the Pet Park, and you can even add a pet on behalf of a resident who is unable to. 6. Last, but not least, you have a new link to view the Resident Site (formerly accessed by going to the Other tab à Resident Portal), so you can see how all of these features appear to residents, the ones using them the most! As always, please feel free to call us at 877-501-7117 ext. 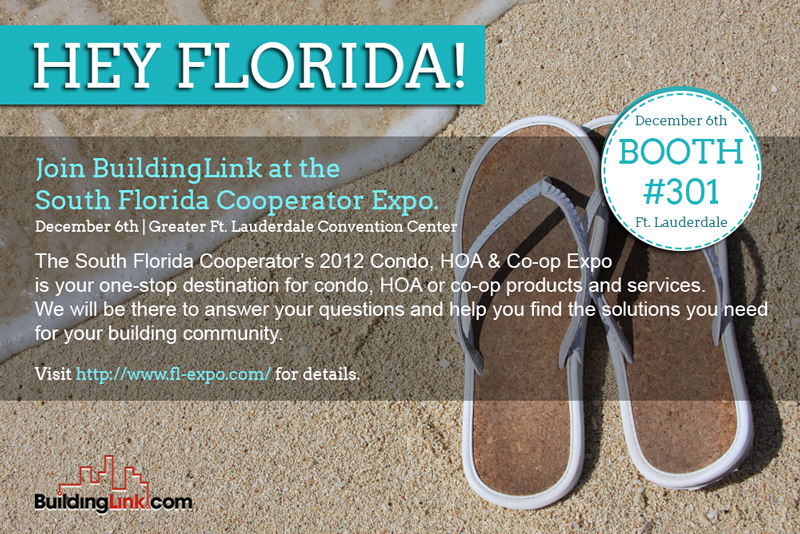 0 or email us at support@buildinglink.com – we’d love to hear what you think!